For the past seven years, BT Ireland has organised ‘BT Shop for Change’ – a one day takeover of Irish Cancer Society shops around the country. Originally titled the BT Charity Shops Challenge, the event was the brainchild of a group of BT employees following the death of a dear colleague to cancer in 2012. The aim of the charity shops takeover is to compete in teams to generate the highest sales and raise the highest amount of money for their shop in that day. 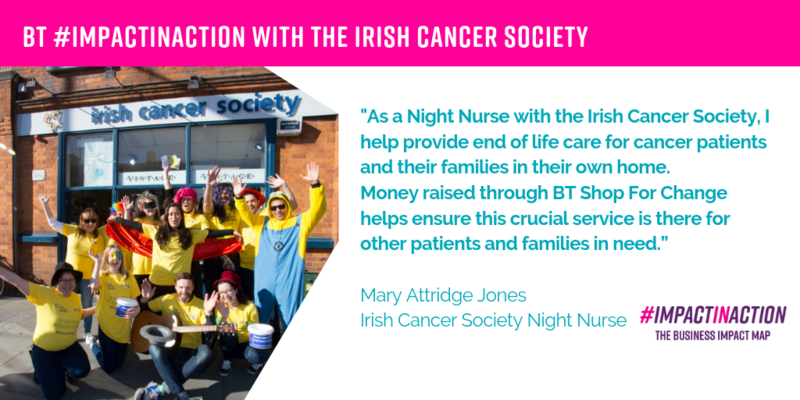 On October 18th 2018, over 120 BT employees took over 11 Irish Cancer Society Shops around the country, raising €186,269 in one day; bringing to over €611,000 the amount raised in total for the Irish Cancer Society through BT Shop for Change since the first event took place. In 2018, we also raised a further €25,000 for the charity through ‘Tour de BT’ – a four day employee cycling tour through Cork and Kerry which took place last September. In total we contributed more than 4,000 hours of volunteering time to the charity in the year, making it the second largest volunteering event after the BT Young Scientist & Technology Exhibition, our flagship charity partnership. Today, BT Shop for Change is our single biggest employee fundraising event. At BT, we have committed to supporting the Irish Cancer Society because their mission is something that is extremely close to our hearts. Cancer is an illness that has impacted the lives of almost all of our employees be it a relative, a friend, or a personal experience. According to the Irish Cancer Society, every three minutes, someone in Ireland receives a cancer diagnosis, and the incidences of cancer are growing. So much so, that by 2020, 1 in 2 Irish people will develop cancer in their lifetime. The aim of the Irish Cancer Society is to reverse this trend by investing in vital cancer research, and by providing support services to help people and their families through their cancer journey. The BT Shop for Change event every October raises crucial funds for the Irish Cancer Society’s cancer research and support services to ensure anyone affected by cancer gets the help they need. One crucial service provided by the Society is Night Nursing, with over 7,000 nights of care provided around the country last year. Night Nurses provide up to ten nights of care to cancer patients at the end of their cancer journey.